The ancient art of shadow puppetry gets a modern day spin with Paperboy’s ‘Hand Made’ wallpaper. An enchanting herd of cleverly crafted hand animals come to life on this FSC accredited sustainable forest paper, available in berry purple ink with hand screen printed animal shapes in shiny silver, or in shadowy black ink atop a classic gray background. ‘Hand Made’ paper is made to order by Robert Hamlin-Wright at his small factory in Norfolk, England. We give it two bunny hopping index fingers way up. Be sure to check out Paperboy’s Animal Magic and Dya-think-e-saurus eco-friendly wallpapers for more unique and mesmerizing wall decor options. 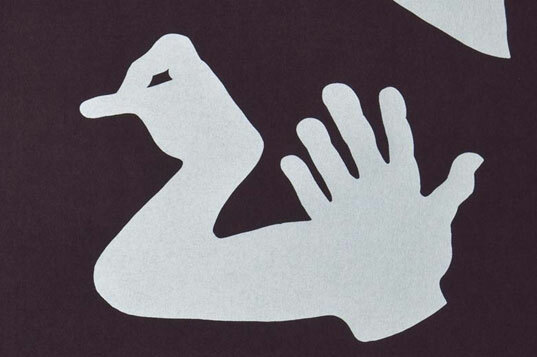 The ancient art of shadow puppetry gets a modern day spin with Paperboy's 'Hand Made' wallpaper. An enchanting herd of cleverly crafted hand animals come to life on this FSC accredited sustainable forest paper, available in berry purple ink with hand screen printed animal shapes in shiny silver, or in shadowy black ink atop a classic gray background. 'Hand Made' paper is made to order by Robert Hamlin-Wright at his small factory in Norfolk, England. We give it two bunny hopping index fingers way up.